If your refrigerator has a "Change Filter"light, reset it. 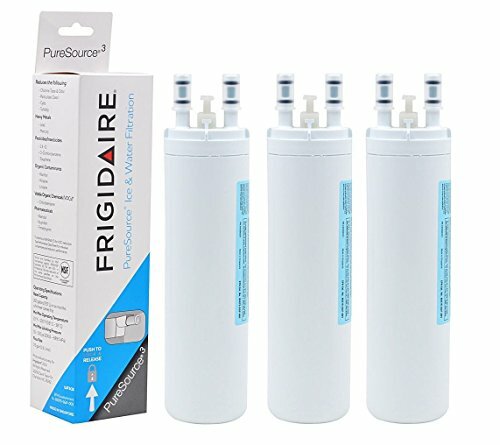 COMPATIBILITY: Compatible with Frigidaire WF3CB Puresource 3 and Kenmore 469999, Frigidaire 242017800, 242017801, ps2364646, a0094e28261, AP4567491, PS3412266, 012505452185, 242069601, 242086201, 706465. Same carbon as OEM brands at tremendous cost savings. This package comes as a single filter. SATISFACTION GUARANTEE: 100% money back Guarantee if not satisfied with product. Buy now with confidence! Good price, high quality,After installing our water purifier, the water is pure, odorless and ready to drink. The advanced carbon block filter can remove 23 contaminants, including turbidity,chlorine, bad taste, heavy metals and retain beneficial minerals in your water. Reducing most chlorine, sediment and other impurities. Choose the Original Standard and Work without Noise and No leak With Fast Water Follow,Our filters deliver fresh and healthy water to you and your family. If you have any questions about this product by Watrure, contact us by completing and submitting the form below. If you are looking for a specif part number, please include it with your message.